Wilfrid Laurier University is the first in Canada to own two life-like synthetic cadavers. The bodies are used in a human anatomy class. Two full-sized, synthetic cadavers now owned by Wilfrid Laurier University are as close as you can get to the real thing, professor Diane Gregory says. The cadavers are used in the human anatomy class for kinesiology students, and Gregory says students were a bit surprised to see the two bodies laying on gurneys two weeks ago. "At the very beginning, there was some mixed emotions, some surprise. The students didn't know they were going to be there," Gregory said. Students had been using plastic models, but those have limitations, she says. "You have to kind of pop a muscle off to get to the ones underneath whereas this, you just sort of push it to the side which is really how muscles work," she said. "That's one of the key things in anatomy is being able to really get a relationship sense of various structures within the body because they're all really nicely integrated and that's one of the amazing things about anatomy is seeing all those connections between things." 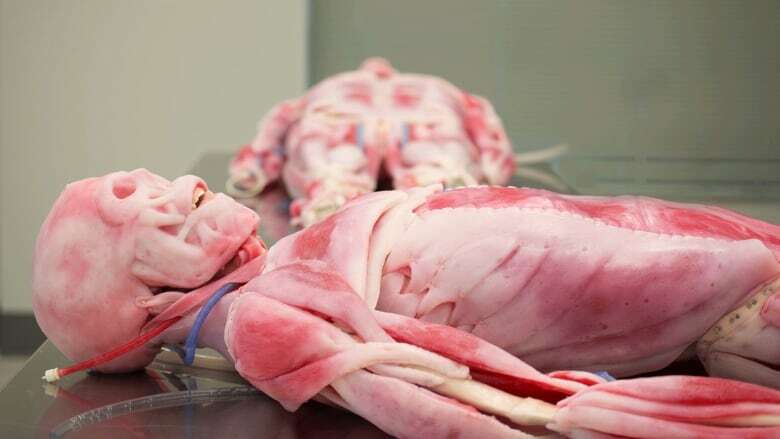 The faculty of science and university funded the purchase of the synthetic cadavers from Florida-based SynDaver Labs, a world leader in synthetic human and animal bodies. Laurier is the first university in Canada to have the life-like bodies in their labs. Gregory did not disclose the price of the bodies, but she did say they were expensive. The cost is worth it for the student experience, she says. "That's one of the real big advantages to having these synthetic cadavers over some of the plastic models that are often seen in anatomy labs," she said. "With those, you just don't get that same sort of sensory or tactile feedback that you do when you're actually dealing with real cadavers that these synthetic cadavers now can provide students." SynDaver Labs says on its website the anatomy model of the body includes "all of the major skeletal, muscular and cartilaginous structures present in typical human anatomy." "This education-grade synthetic human cadaver [comes] complete with all bones, joints, muscles, organs and tendons in normal human anatomy. Major nervous system and vascular components are also included." The company said the synthetic bodies are made of non-toxic, non-latex tissues made from "water, fibres and salts." The company also makes animal versions for veterinarian research. Gregory says it's rare for undergraduate programs to use human cadavers, and setting up a lab to use real bodies is complex and expensive. After they get a sense of how students use these synthetic bodies, Gregory says she'd like to see the purchase of more to be used in other courses, including physiology and biology. Currently, the two synthetic bodies are being shared by hundreds of students, Gregory says. "When we can show that students are really successful in the course because of these additional resources, and they're really enjoying the experience and that it's a reason that somebody would choose Wilfrid Laurier University over potentially another university, then we'd hope to see the purchase of additional ones," she said. Quirks & Questions: Why isn't cadaver blood donated for transfusions? Surgeon says Regina is wasting opportunities to harvest human tissue, is instead buying from U.S.